Similar to other religious communities of India, our Sikh community also considers cow as holy being and takes care of the same. Post independence, precisely 1952 onwards our organization actively began on preserving desi Indian cows and promoting Sahiwal breed in particular. Sahiwal breed is native of Punjab. Originally found in Pakistan (before partition it was part of India), the breed is our treasure. Pure Sahiwal cows yield A2 milk that is packed with essential nutrients and has very good taste. The milk is sold at Rs. 70-90/litre depending on the market. Apart from milk, its dung and urine are ‘amrit’ (called elixir in English) for farming because it is rich in beneficial microbes. In our gaushala total herd size is 330 including pure Sahiwal cows, bulls and calves. We always have on an average are 50-60 milking cows. There are six bulls. The shed is scientifically designed with separate segment for dry cows, new born calves, milking cows, sick cows, bulls etc. Sahiwal cows yield supreme quality of milk with fat percentage more than 4.5%. Milking capability of this breed on an average is 8-12 litre/day but some special cows yield 20+ litre/day. We are sure as the breed develops the coming generations of the cows will yield more milk because it is a milking breed of India. Further, we strongly feel as the cows are diseases resistant and integral part of the farming farmers must rear Sahiwal cows in their farm. It certainly will bring prosperity to the farmer. 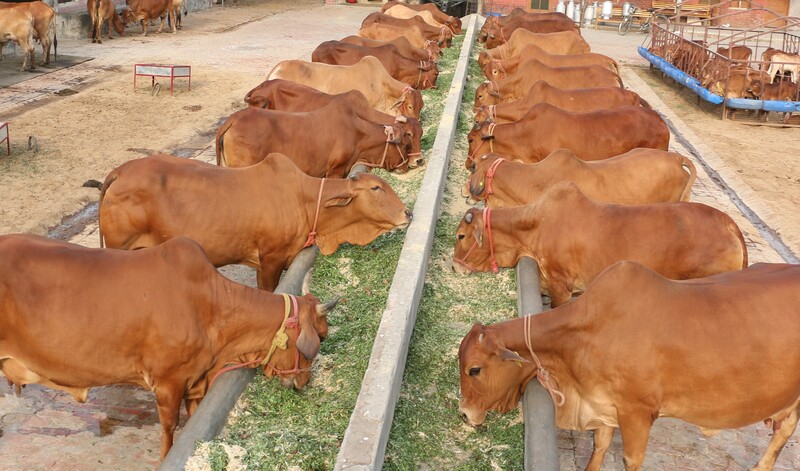 Cows are milked twice in the gaushala and thrice for those yielding more than 20+ litre/day. It is done manually as well as with milking machines however Sahiwal cows are most comfortable with manual milking by the same person. It creates the bond with the caretaker thus it is better. Milk produced is circulated to the employees of the organization at large. It is never sold in the market. We have 5-6 pure Sahiwal bulls for breeding. Natural mating and Artificial Insemination (AI) both are used for reproduction. We are very cautious about in-breeding therefore to avoid it entire herd is tagged with a special code. Besides we maintain detailed prodigy of every cow, bull and calf. Female calves are retained in the farm while male calves are given only for breeding purpose that too after checking the credentials of the farmer/dairy farm meticulously. Being a gaushala we are extremely particular about the way our calves are treated. To be assured the male calf is well taken care off we maintain a regular touch with the beneficiaries. Female calves are given only with a special permission from our Guruji with the sole objective to improve next generation of Sahiwal breed. However these are very rare cases that complies extensive process. Entire herd is fed with in-house grown fodder in 50+ acre. We give 50-60 kg/day green fodder to every cow and bull. Green fodder varies as per season for example presently we are giving Berseem (Trifolium alexandrinum) then maize in winters followed by guar etc. Dry fodder is given 2-3 kg per day majorly sorghum or wheat straw. Additionally we give concentrate, again prepared in-house. The ratio followed for giving concentrate for each cow is as per its milk yield that is 1 litre milk: 400 grams concentrate. It is given twice a day. Bulls are fed with 6-8 kg concentrate/day. Concentrate is a mix of 14-15 items that ensures to fulfill the nutrition requirement of the cows. It is prepared under the direction of veterinarians formally appointed at gaushala. Approximately 15 days prior to the delivery the cows are given oil to make the delivery process easy. The oil variant is selected as per the season such as sesame oil is fed only in winters. Post delivery, cows are given porridge of bajra (pearl millet) and jaggery for a week to cleanse their internal system. 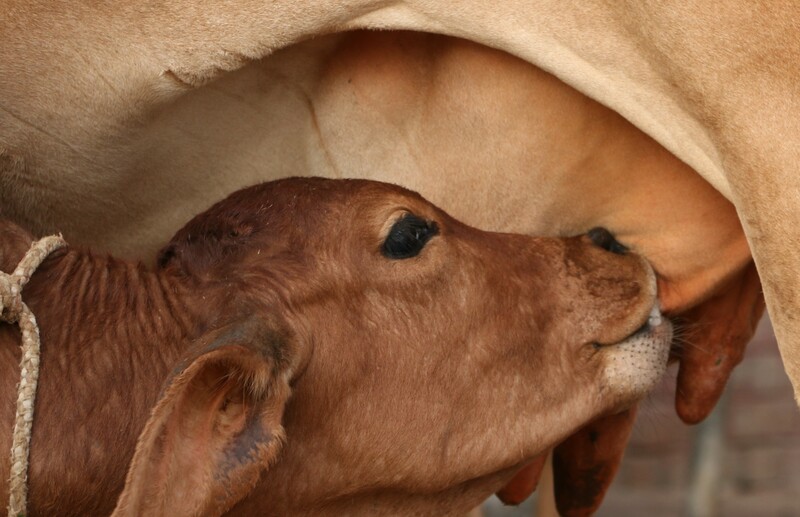 The new born calf is also first given a little jaggery to lick and then after it only takes its Mother’s milk for initial one month. Later fodder is introduced step-by step. Many members associated with the gaushala are farmers or own farms, they donate their first harvest to us for feeding the herd. We also get such donations from non-members thereby our store house is always full of fodder. 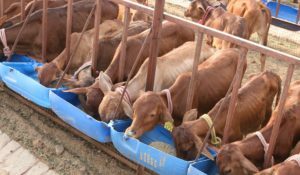 Herd is vaccinated as per the standard norms only as precautionary measure because Sahiwal breed seldom falls sick therefore medication is hardly required. Nevertheless every cow, bull and calf undergoes routine medical check-up by veterinarians. Our organization is committed to protect and promote Sahiwal breed. People from other countries like Brazil have taken our native breeds of cows and developed it magnificently then why not us! It originally belongs to us and we must sincerely develop only desi breeds and not exotic dairy breed animals. Our vision is to reverse the attention of dairy farmers towards Sahiwal breed and for that we are developing the breed in best possible way. We have to preserve it for future generations for sure.